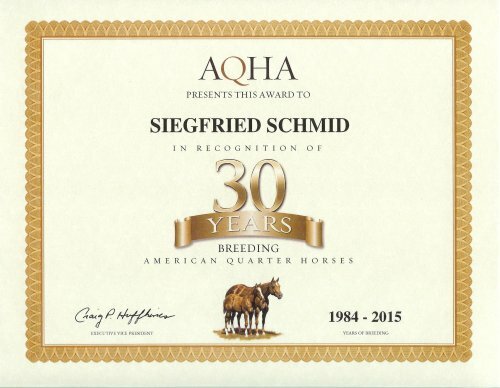 I, Siegfried Schmid have been an AQHA member since 1979. I began importing Performance and Foundation Quarter Horses to Germany for competition and breeding in 1980. In 1984 I registered my first German born American Quarter Horse and as of today I have produced approximately 300 American Quarter Horse foals in the last 32 years. Together with my wife Alexandra, better known as "Sandra" I moved my Quarter Horse breeding operation and export business from Germany to the 'Top of the Hill Country' between Cranfills Gap and Clifton, Texas in 1991. We make every effort to meet and exceed our customer expections with every business transaction, from the purchase of a weanling to the breeding of a mare to one of Fox Ranch's fine stallions. 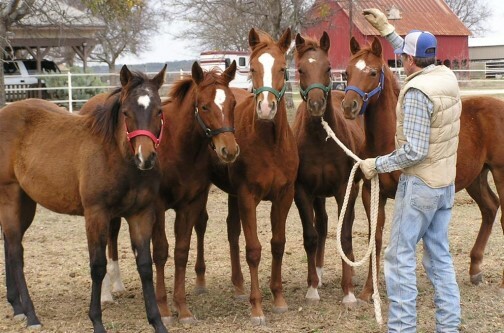 We are passionate about raising high quality, working Quarter Horses with an emphasis on the old foundation bloodlines of King Ranch bred horses. Descendants of King 234, Leo, Wimpy, and Three Bars (TB) are also an important part of our carefully focused breeding program here at Fox Ranch. Clifton is located about 2 hrs south of Fort Worth, and 1 hour north-west of Waco, Texas. We do not offer any internships, nor do we have open positions for work. Thanks for checking out our web-site. We appreciate your business.